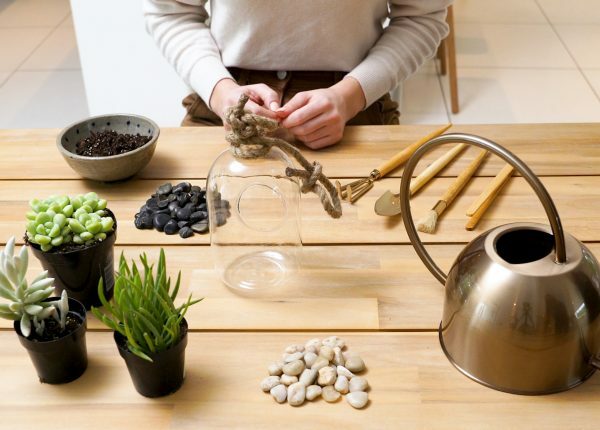 In this plant-obsessed world, not having garden space can make a person feel left out. Especially when it’s patio season. You just want to extend your plant life to the outdoors!!! Is that too much to ask? According to your townhome patio / small apartment deck / black thumb, yes. Yes it is. 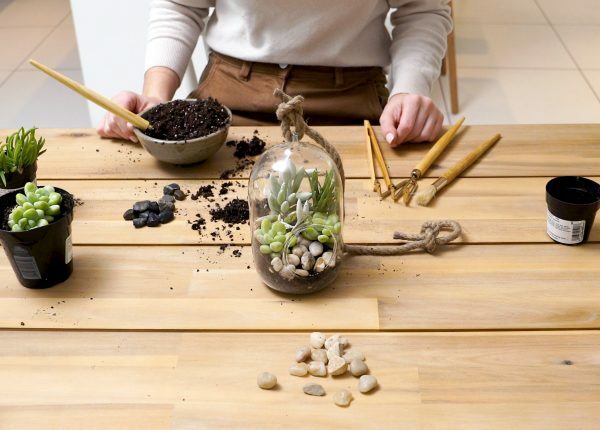 Making your own terrarium is a great way to inject a little low cost, low maintenance plant life into your outdoor space. The best part? It’s super portable. 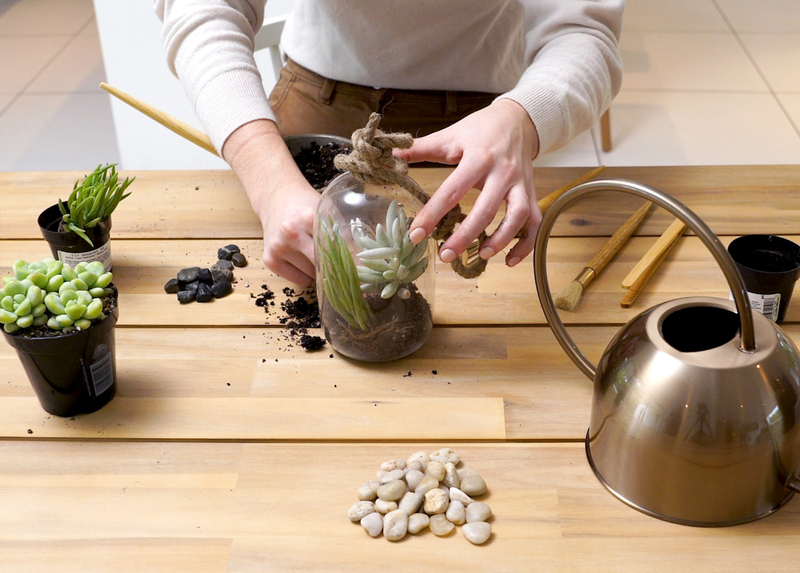 Follow along to learn how to make your own terrarium. A vessel. 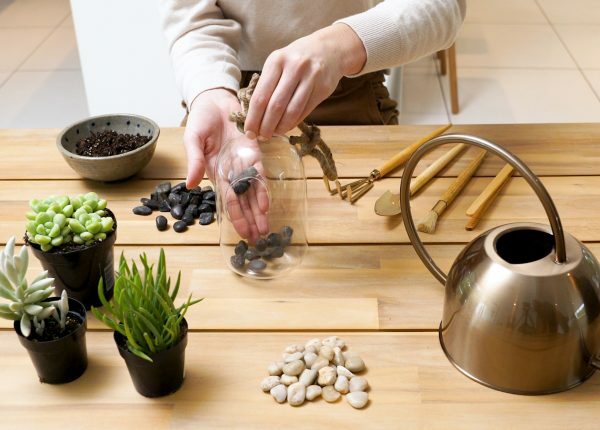 Your terrarium can be in a pretty bowl, a glass orb, or even a portable pot. Pick something that you like, and that works with your decor. 3-4 small plants. Make sure that your chosen plants need the same amount of water, sunlight, and the same kind of soil. Some extra soil. Make sure your soil is the appropriate pH for your chosen plants! Your local garden store will be able to help. A long-handled paint brush to clean up dirt specks. Step 2: Add Your Drainage Rocks. If you’ve ever had a plant turn yellow and die on you, it’s probably because it was waterlogged. Proper drainage helps plants drink up only the water they really need, as opposed to being force fed hydration that their poor leafy bodies can’t handle. 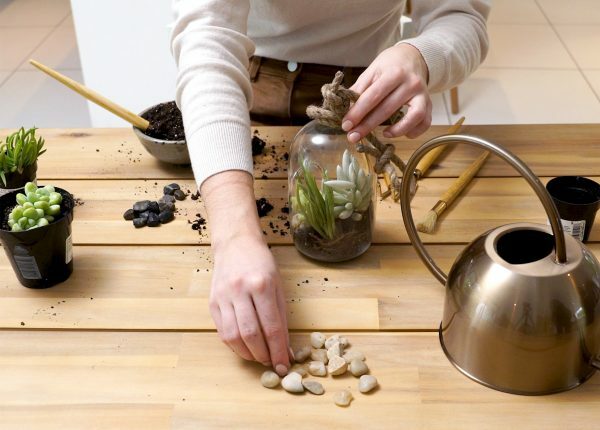 Your drainage rocks should be small and cluster together well — otherwise you run the risk of your dirt getting into the crevices and everything just becoming mud. 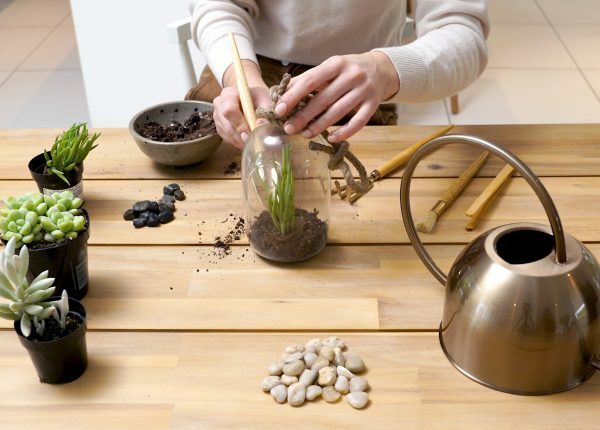 Now, gently depot your plants and shake off excess dirt. Their roots are very delicate, so take care. Nestle them into your terrarium. You can use extra dirt to create height and dimension. Make sure each plant have a good amount of dirt. Dirt is food! Have some fun with it! While we’ve only listed decorative rocks, you could really go nuts here. Think plastic animal toys, glass beads, whatever your heart desires. Simply place your decorative elements however you like best. Step 5: Clean and Enjoy. Using your long-handled paint brush, brush away the excess dirt. Your terrarium is ready for its close up. Place next to you on your deck and enjoy the mini garden vibes.